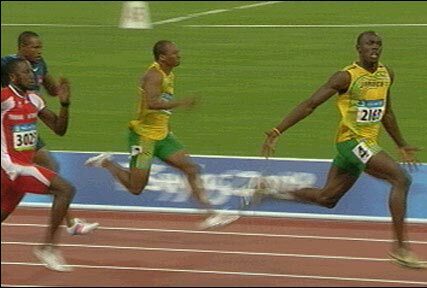 Usain Bolt seemed to trot to finish a mile ahead of the competition in the Olympic 100m sprint Saturday. In the process he set a new world record of 9.69 seconds erasing his own 9.72 mark set in May at a meet in New York. In almost an all-Caribbean final with six of the eight competitors from Jamaica, three; Trinidad and Tobago, two; and one from the Netherlands Antilles, Bolt rewrote the history books, winning Jamaicas first gold in the event. Disappointingly, countryman, Asafa Powell, who was touted as a possible winner, finished out of the medal frame. Bolt had a less than perfect race as his left instep dragged on the track out of the starting block, and he pulled up to a almost a jog at about 80 meters and began celebrating as he glanced to his right, seeing no one close by. “No one will get near it,” fellow Jamaican Michael Frater, who finished sixth. Of his own disappointing showing Powell said, “I messed up big time, my legs died on me. Usain ran an awesome race, I’m very happy for him. Trinidad and Tobago’s Richard Thompson was second in 9.89 and third went to USA’s Walter Dix as the first six runners posted sub 10 second times. Bolt now readies for his specialty, the 200 meters and a possible golden double. He also is in a great position to take three golds as the Jamaican sprint relay team combines Powell and Frater.